EXCERPT FROM THIS ARTICLE: The seeds of the mortgage meltdown were planted during Bill Clinton’s presidency. Under his HUD secretary Andrew Cuomo, Community Reinvestment Act regulators gave banks higher ratings for home loans made in “credit-deprived” areas. Banks were effectively rewarded for throwing out sound underwriting standards and writing loans to those who were at high risk of defaulting. If banks didn’t comply with these rules, regulators reined in their ability to expand lending and deposits. Washington is a place where bad ideas go to live forever. How else to explain the latest innovation from federal regulators to keep Fannie Mae and Freddie Mac dominating the market for mortgage finance? Prior to the financial crisis of 2008, these two government-created behemoths owned or guaranteed more than $5 trillion in mortgage debt. When the housing boom went bust, taxpayers were forced to provide a $188 billion bailout to the toxic twins—and endure an historic financial crisis. So the taxpayer interest is in shrinking and eventually shutting down Fan and Fred. But these days the Federal Housing Finance Agency that supervises the twins under federal “conservatorship” seems to view itself as the official preserver of Fan and Fred’s market share. So instead of simply telling the mortgage giants to stop buying and guaranteeing so many mortgages, the regulator has been encouraging the use of ever more complex financial instruments to keep Fan and Fred at the center of this multi-trillion-dollar market. One Fan and Fred innovation—check your wallet when that word is used in government—is to use synthetic collateralized debt obligations (CDOs) to offload some of the mortgage risk they are holding. These new instruments are essentially a way for the mortgage giants to buy insurance against the possibility that lots of mortgage borrowers don’t repay the money they owe. But how about simply not holding these risks in the first place? Then taxpayers would have no need for insurance. Fan and Fred are selling the CDOs to private investors, who are getting compensated with juicy yields in return for theoretically accepting much of the default risk in Fan and Fred’s bundles of mortgages. The program is ramping up and now covers at least some of the risks on more than $800 billion in mortgages of the more than $4 trillion that Fan and Fred still own or guarantee. EXCERPT FROM THIS ARTICLE: The point is that government and politicians have no learning curve. All of the conditions of financial wreckage are reappearing. This is why congressional Republicans absolutely should put up a fight on the debt ceiling by requiring more budget discipline as a condition of higher debt levels. They should require at least 8-10 percent downpayments on all government insured mortgages. They should repeal all or part of the Dodd-Frank bill that is destroying community banks, while promising voters they will never again bail out a bank or financial institution. Finally, they should be urging the Fed to restore sound money by gradually raising short term interest rates. And the presidential candidates should start warning voters that Washington is rebuilding another financial house of cards. As Peter Wallison of the American Enterprise Institute and other scholars have thoroughly documented, the crash of 2008 was caused by the Federal Reserve’s easy money policies for nearly a decade, government housing policies that led to preposterous mortgage loans being issued, and massive overleverage of government, companies, and households. 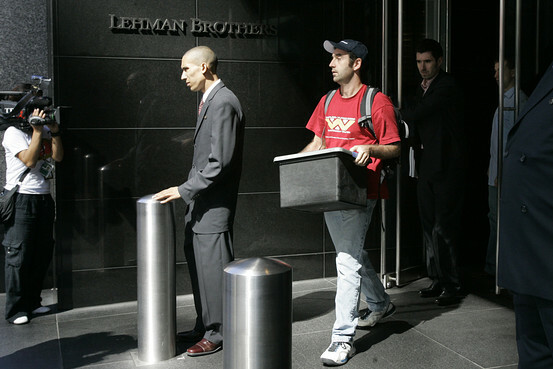 Blame for the 2008 financial collapse is, and should be, widespread. EXCERPT FROM THIS ARTICLE: Wallison ends on a distressing note. He asserts that because experts have embraced a false narrative about the crisis, the remedy of Dodd-Frank will not protect us from the next calamity. Actually, it’s worse than this. The answer to the financial crisis may have been hidden in plain sight, but the failure to see it was willful. A powerful coalition of interest groups dominated housing policy for a generation, and they still do—despite the damage that policy caused in the Great Recession. Peter J. Wallison must be quite familiar with this idea. A longtime critic of Fannie Mae and Freddie Mac, the government-sponsored enterprises (GSE) tasked with injecting liquidity into the secondary mortgage market, he has offered warnings about these agencies that have fallen on deaf ears for over a decade. When he and Edward Pinto, his colleague at the American Enterprise Institute, correctly pointed out that Fannie and Freddie were loaded up with the subprime mortgages that contributed to the financial collapse of 2008, and that maybe—just maybe—this had something to do with the mess, they were greeted with accusations of Hitlerism. “The Big Lie” is what Joe Nocera of the New York Times accused Wallison and Pinto of propagating. Remember the S&L crisis? Nobody else does either. And we’ll soon forget about 2008 too. Alex J. PollockMr. Pollock is a resident fellow at the American Enterprise Institute and was president and CEO of the Federal Home Loan Bank of Chicago 1991-2004. PETER J. WALLISON holds the Arthur F. Burns Chair in Financial Policy Studies at the American Enterprise Institute. Previously he practiced banking, corporate, and financial law at Gibson, Dunn & Crutcher in Washington, D.C., and in New York. He also served as White House Counsel in the Reagan Administration. A graduate of Harvard College, Mr. Wallison received his law degree from Harvard Law School and is a regular contributor to the Wall Street Journal, among many other publications. He is the editor, co-editor, author, or co-author of numerous books, including Ronald Reagan: The Power of Conviction and the Success of His Presidency and Bad History, Worse Policy: How a False Narrative about the Financial Crisis Led to the Dodd-Frank Act. The following is adapted from a speech delivered at Hillsdale College on November 5, 2013, during a conference entitled “Dodd-Frank: A Law Like No Other,” co-sponsored by the Center for Constructive Alternatives and the Ludwig Von Mises Lecture Series. The 2008 financial crisis was a major event, equivalent in its initial scope—if not its duration—to the Great Depression of the 1930s. At the time, many commentators said that we were witnessing a crisis of capitalism, proof that the free market system was inherently unstable. Government officials who participated in efforts to mitigate its effects claim that their actions prevented a complete meltdown of the world’s financial system, an idea that has found acceptance among academic and other observers, particularly the media. These views culminated in the enactment of the Dodd-Frank Act that is founded on the notion that the financial system is inherently unstable and must be controlled by government regulation. We will never know, of course, what would have happened if these emergency actions had not been taken, but it is possible to gain an understanding of why they were considered necessary—that is, the causes of the crisis. Why is it important at this point to examine the causes of the crisis? After all, it was five years ago, and Congress and financial regulators have acted, or are acting, to prevent a recurrence. Even if we can’t pinpoint the exact cause of the crisis, some will argue that the new regulations now being put in place under Dodd-Frank will make a repetition unlikely. Perhaps. But these new regulations have almost certainly slowed economic growth and the recovery from the post-crisis recession, and they will continue to do so in the future. If regulations this pervasive were really necessary to prevent a recurrence of the financial crisis, then we might be facing a legitimate trade-off in which we are obliged to sacrifice economic freedom and growth for the sake of financial stability. But if the crisis did not stem from a lack of regulation, we have needlessly restricted what most Americans want for themselves and their children. It is not at all clear that what happened in 2008 was the result of insufficient regulation or an economic system that is inherently unstable. On the contrary, there is compelling evidence that the financial crisis was the result of the government’s own housing policies. These in turn, as we will see, were based on an idea—still popular on the political left—that underwriting standards in housing finance are discriminatory and unnecessary. In today’s vernacular, it’s called “opening the credit box.” These policies, as I will describe them, were what caused the insolvency of the government-sponsored enterprises (GSEs) Fannie Mae and Freddie Mac, and ultimately the financial crisis. They are driven ideologically by the left, but the political muscle in Washington is supplied by what we should call the Government Mortgage Complex—the realtors, the homebuilders, and the banks—for whom freely available government-backed mortgage money is a source of great profit. Alan Greenspan argues that Wall Street didn’t predict the 2008 crisis because it paid scant attention to the insights of behavioral economics. EXCERPT FROM THIS ARTICLE: Bubbles and crashes will always be characteristics of free-market systems, but they need not lead to economic crises. In 1987 the stock market fell over 20% in a single day, but the effect on economic activity was minimal because holders of common stock weren’t highly leveraged. The bursting of the Internet bubble in early 2000 left only a mild imprint on the financial system and the real economy for the same reason. The crash of the housing bubble was devastating because the toxic mortgage-backed assets were held by highly leveraged institutions, and this debt was short-term rather than “permanent” and thus especially susceptible to “runs” where lenders were unwilling to “roll over” their short-term loans. “It was the capital impairment on the balance sheets of financial institutions that provoked the crisis,” Mr. Greenspan writes. In his view, the answer is not more regulation but more capital. “The Map and the Territory” ranges beyond the market crisis and predictive models. Mr. Greenspan offers a conservative but balanced discussion, for instance, of the need to restrain the growth of entitlement spending. In his section on income inequality he emphasizes the role of globalization and the rise in stock-based compensation, as well as the failure of our education system to produce skills for the workforce that match the needs of the economy. He says that immigration reform, by loosening the requirements for H-1B visas, would allow us to draw on a large pool of skilled workers abroad and thus stabilize income inequality. At the moment, immigration restrictions protect, and thus subsidize, high-income earners from global wage competition. The financial crisis of 2008 and the deep recession that followed forced each of us—perhaps most notably, Alan Greenspan —to question the fundamental assumptions about risk management and economic forecasting. Mr. Greenspan, the nation’s chief forecaster as chairman of the Federal Reserve Board, steered the nation through almost two decades of prosperity and relative stability, retiring from the Fed in 2006 with an unparalleled reputation for prescience. And then came the economic crisis, and no one’s reputation for prescience survived.